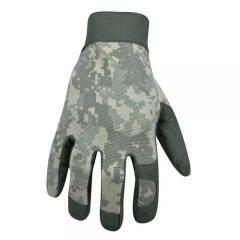 Protect your hands but maintain a full range of motion with Authentic ACU Gloves from Ringers. Ringers's gloves are constructed using spandex so they stretch and move with you as you complete your various tasks unhindered. The ACU features high quality synthetic leather on the palms and fingers to both reinforce and give you a better grip on your tools. The glove includes hidden seams and a split palm, which also contribute to better movement. The tight fit grips your hand and provides a better tactile experience. When you need to get the job done, make sure your gloves are authentic!